Who doesn't love a simple dress that can be styled in several different ways? Here I have it styled a little on the dressier side, which I would wear for work. But I think I'll also be wearing it without the layers, with a few shorter necklaces, and sandals or wedges all summer long. I got this dress during a shopping meet up with some awesome fellow NC bloggers! That day there happened to be one of the J. Crew Factory 50% off everything sales, so I got it for a really great price, it's so comfy, and I'm kind of love with the kelly green color. It also comes in navy, cobalt blue, and bright pink! Gorgeous dress! 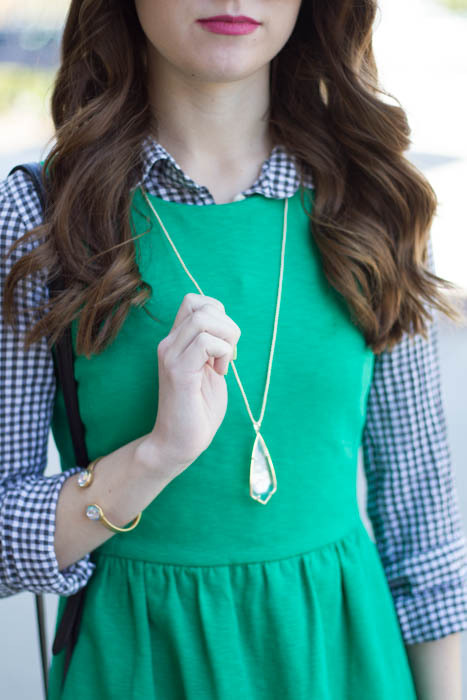 Love how you layered it with the gingham! The green looks so great with blue gingham. I looooove this layered look and they both go so well with one another!